Health and appearance of gingiva form an essential component of an attractive and pleasing smile. Gingival hyperpigmentation refers to an increase in the pigmentation in gingival tissue which can be clinically manifested as multifocal or diffuse melanin pigmentation. Melanin pigmentation results due to excessive production of melanin granules by melanoblasts which can be associated with various exogenous and endogenous factors including certain drugs, heavy metals, genetics, endocrine disturbances, syndromes as Albright's syndrome, Peutz–Jeghers syndrome, and adverse habits such as smoking. The melanoblastic activity of defining the degree of pigmentation varies from individual to individual. Although gingival melanin pigmentation is completely benign and does not present a medical problem, it becomes a major concern among patients having a very high smile line (gummy smile). Gingival depigmentation is a periodontal plastic surgical procedure where the hyperpigmentation is treated using various techniques including surgical, chemical, electrosurgical, and cryosurgical procedures. However, more recently, laser ablation has been recognized as one of the most effective, comfortable, and reliable techniques. The present case series describes two cases of simple and effective depigmentation technique using 980 nm diode laser with good results and patients satisfaction. 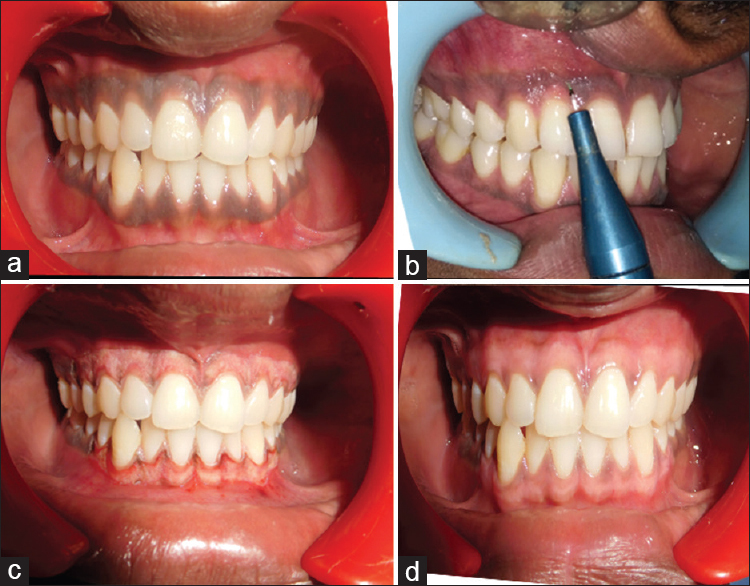 A 24-year-old male patient visited the Department of Periodontics and Oral Implantology, Subharti Dental College and Hospital, Meerut, with the chief complaint of unpleasing smile due to blackish gums [Figure 1]a. Oral examination revealed melanin hyperpigmentation of gingiva affecting both maxillary and mandibular arches. Therefore, gingival depigmentation was planned with diode laser for its correction. A 22-year-old male reported with a chief complaint of black gums. The patient was young and conscious esthetically. On clinical examination, healthy periodontium with pigmented gums in both maxillary and mandibular arch was observed along with a fractured central incisor in first quadrant [Figure 2]a. Gingival pigmentation was not visible in the mandibular arch while smiling; therefore, depigmentation procedure was carried out only in the maxillary arch. After explaining the procedure written consent was obtained from the patients. To rule out any systemic involvement and contraindication for surgery, a thorough medical examination, family history, and blood investigations were done. Routine oral hygiene procedures were performed before the surgery, and a preprocedural mouthrinse with 2% chlorhexidine for 1 min was done to maintain asepsis during treatment. Infiltration anesthesia was administered in the concerned arches in the anterior region (lignocaine with adrenaline in the ratio 1:200,000). Depigmentation was performed using 980 nm diode laser in the concerned arches. Both the patients were prescribed diclofenac potassium 50 mg + paracetamol 325 mg + serratio–peptidase 10 mg for 3 days. Chlorhexidine mouth rinse was advised 2 times a day for 1 week. Patients were recalled after 1 week and then after 1 month. Good soft tissue was observed, and patients did not report any discomfort. At the end of 1 month, re-epithelialization was complete and healing was found to be satisfactory, and no further repigmentation was seen [Figure 1] and [Figure 2]. Oral melanin pigmentation is a common finding occurring in almost all the races. It is associated with hyperactivity of melanocytes which are located in the basal layer of oral epithelium. The occurrence of gingival pigmentation is irrespective of the gender; however, the amount of physiologic pigmentation is probably determined genetically. However, according to Ciçek and Ertaş the degree of pigmentation is also related to mechanical, chemical, and physical stimulation, for example, smokers demonstrate more amount of gingival pigmentation than nonsmokers. This pigmentation causes blackening of gums which appears unpleasing during smiling thus most patients seek its removal due to esthetic concerns. Various treatment modalities have been used for this purpose including scalpel, electrosurgery, cryosurgery, abrasion using bur, and laser. The lack of depth control and inadequate access to the certain area makes the use of abrasion technique using a large round diamond bur difficult. Whereas, the undesirable hemorrhage and increased postoperative discomfort along with the need to cover the surgical site for 7–10 days makes the administration of this technique unpleasant to the patient. Electrosurgery requires more expertise than scalpel surgery. Furthermore, application of electrosurgical electrodes should be done with utmost care as its contact with bone or teeth may cause damage to the underlying structures and the heat accumulation in tissues may cause undesired tissue destruction. With cryosurgery, it is difficult to control the depth of penetration which can cause increased soft-tissue destruction resulting in considerable swelling, and increased patients discomfort. A free gingival graft can also be used to but, it requires a second surgical site and color matching is also an issue with this technique. Keeping these factors in mind laser is highly recommended. The semiconductor diode laser is emitted in continuous wave or gated-pulsed modes and contact mode preferably. Emitted laser light is poorly absorbed in water but highly absorbed in hemoglobin and other pigments which make it an excellent choice for cutting and coagulating soft tissues. The diode laser exhibits thermal effects using the “hot-tip” effect caused by heat accumulation at the end of the fiber and produces a relatively thick coagulation layer on the treated surface., The usage is quite similar to electrocauterization but tissue penetration is less. In the present cases, the use of diode laser did not produce any deleterious effect on the root surface. Moreover, it proves to be safe to be used in proximity to dental hard tissue or bone. The healing period was shorter without any unpleasant bleeding during and after the operation or the necessity to cover the exposed surgical area with a periodontal dressing for 7–10 days. Gingival health and appearance play an important role in building a patients smile. The demand for an esthetically pleasing smile requires the removal of unsightly pigmented gingival areas. The application of diode laser is minimally invasive treatment option which can be considered as safe and effective alternative procedure for the treatment of gingival melanin pigmentation. Its benefits include ease of usage, effectiveness in the treatment of superficial benign pigmented lesions, convenience in dental clinics, and decreased trauma for the patient. In the present cases, none of the patients reported pain or discomfort. The healing was good, and the patients were satisfied with the results and their smile. Rosa DS, Aranha AC, Eduardo Cde P, Aoki A. Esthetic treatment of gingival melanin hyperpigmentation with Er: YAG laser: Short-term clinical observations and patient follow-up. J Periodontol 2007;78:2018-25. Shafer WG, Hine MK, Levy BM. Text Book of Oral Pathology. Philadelphia: W.B. Saunders Co.; 1984. p. 89-136. Tal H, Oelgiessr D, Tal M. Gingival depigmentation for aesthetic purposes using erbium: YAG laser: Rationale and technique. Refuat Hapeh Vehashinayim (1993) 2002;19:25-32, 69. Ciçek Y, Ertaş U. The normal and pathological pigmentation of oral mucous membrane: A review. J Contemp Dent Pract 2003;4:76-86. Kanakamedala AK, Geetha A, Ramakrishnan T, Emadi P. Management of gingival hyperpigmentation by surgical scalpel technique. J Clin Diagn Res 2010;4:2341-6. Featured Wavelength. Diode – The diode laser in dentistry (Academy report) Wavelengths. Acad Laser Dent 2000;8:13.